Thank you all my friends and viewers. 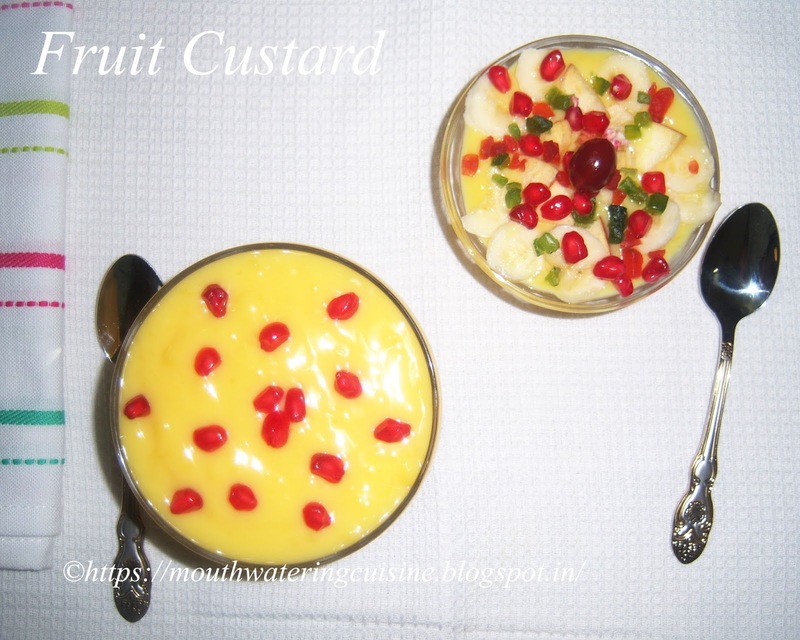 Today I am posting how to make custard recipe or fruit custard recipe. Custard or Fruit Custard, Vermicelli Payasam or Semiya Payasam and sabudana payasam are the dessert and sweets with which we were acquainted from our childhood. These are all very easy and quick to make dessert and sweets. We need no prior planning. Custard with jelly and lots of fruits is a delicious and stomach full dessert. Serve it warm or chilled. I like both ways. It is my another all time favourite dessert which can be made anytime with readily available custard powder, sugar and milk. I thought of posting it long back but a bit hesitated to post because there is no special skill is required and less cooking is involved in making this. So, I keep postponing its publishing though I made it quite a number of times. Plenty of milk available in the refrigerator means that evening surely I prepare it. Top it with lots of fruits and serve it. A small surprise to my people. Fruit Custard Recipe -- A simple and quick dessert made with milk. In a thick bottomed pan add little water and pour milk. Heat the milk and bring it to boil. Stir ocassionally. In a bowl combine custard powder and chilled milk. We can use any flavour custard powder, I normally use vanilla flavour only. Make a smooth paste without any lumps. Add more milk to make it pouring. When the milk starts boiling, simmer the flame and add sugar. Stir it well so that the sugar dissolves completley. Let the flame be in low only. Now slowly add the custard mixture to the boiling milk, stirring continuously. Let it boil for a while, stirring ocassionally till the custard mixture cooks. Switch off the flame. Remove the vessel from the stove top. Allow this to cool completley. Serve chilled custard with garnished fruits or without fruits also it tastes good. In a serving bowl, spread a spoonful of custard. Again spread another spoonful of custard. Garnish pomagranate seeds, tutty fruity and a small cherry on top of it. For more snacks click here.Thank you for visiting my blog. Hope you liked all my recipes. Any feedback and comments are appreciated.